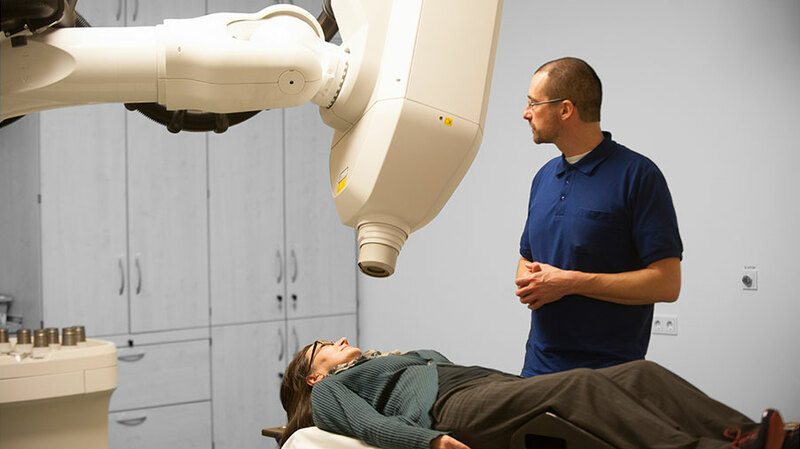 CyberKnife stands for one of the most advanced therapies for treating many tumor types by assuring the highest level of comfort for the patient. 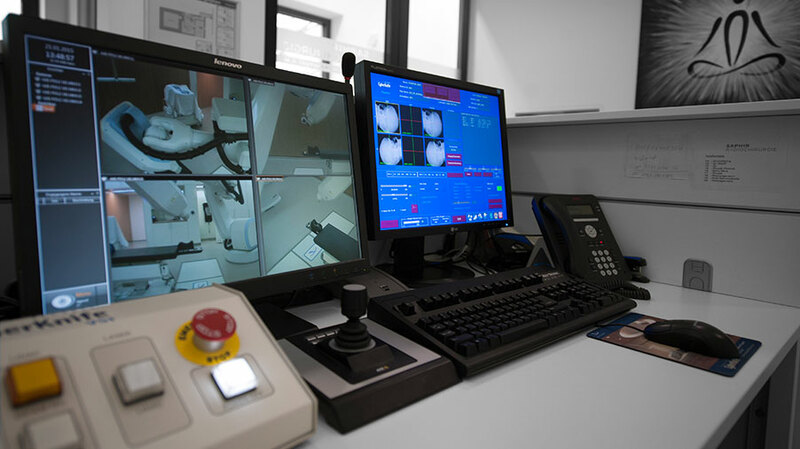 As a result of the sophisticated digital image guidance and robotic control, high radiation doses can be focused with an accuracy of fractions of a millimetre. This guarantees a minimum effect on healthy organs at maximum effectiveness. As the only system worldwide, CyberKnife is able to balance the respiration-induced movements in the body. This is of decisive advantage, particularly for moving tumors in the lungs and liver. Our team and partners have been working on the development of the CyberKnife for years. Thus, our expertise is unique worldwide and our treatment results speak for themselves. The industrial robot arm developed in Augsburg has been specifically redesigned for medical use. It is equipped with six axes with which the mounted miniature linear accelerator can be aligned freely in the room. The miniature linear accelerator can irradiate at 6 mega-electron volt (6 MeV) photons which are focused by special lead shields and shaped like a cylinder. 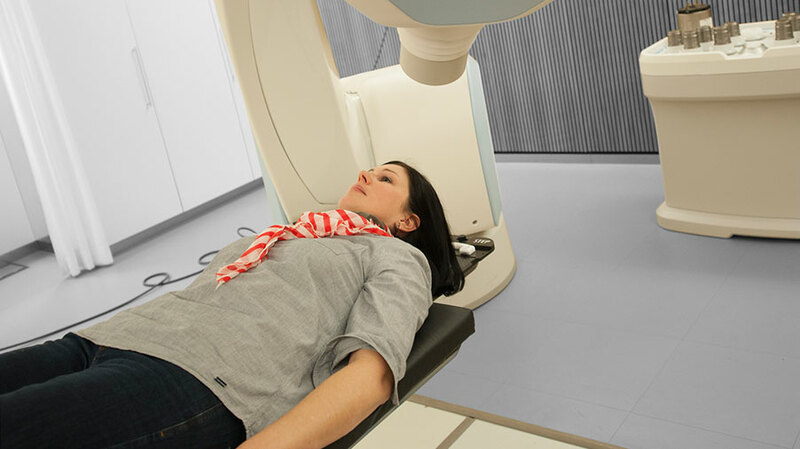 Based on the bone structures, implanted gold markers or the tumor itself shown on the radiographs, the CyberKnife can locate the target area most accurately during the treatment. A special computer program is comparing the images of the planning CT with those of the treatment and is automatically compensating possible deviations by using the robot arm. This technology is unique in the world. Besides the tumor localization, the CyberKnife is also able to compensate movements such as those caused by breathing. 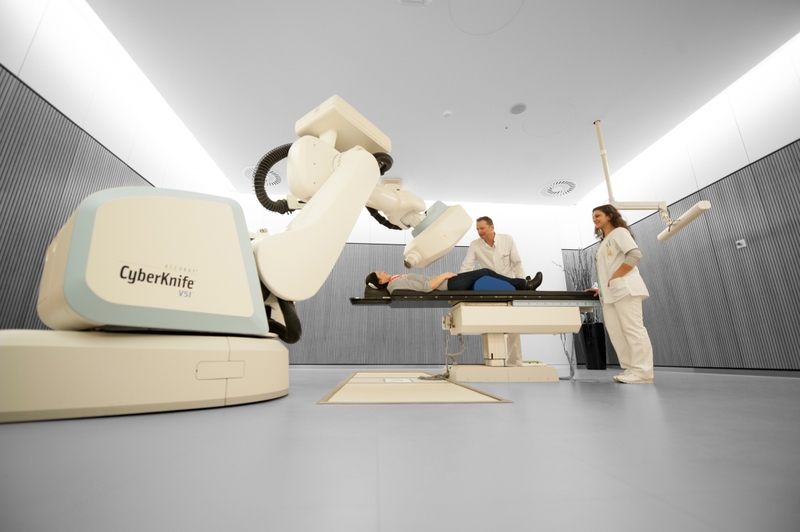 By means of permanently visible infrared markers and special computer models, the CyberKnife can predict the position of the tumor at any time and correct the treatment radiation accordingly. This technology is today considered as the gold standard for the treatment of moving tumors. The CyberKnife is excellently suited for intracranial radiosurgery, that is to say for treatments within the skull. This technology is superior to any conventional system – documented in numerous technical and clinical studies. Even with moving tumors (e.g. in the lungs and liver) the CyberKnife System represents the most accurate treatment system with a minimum of uncertainty. The SAPHIR team works closely together with the Institute of Robotics and other leading centers for medical physics. In this respect our radio surgery centers are among the most technically experienced treatment centers worldwide. Furthermore, we are setting new standards of quality assurance and irradiation planning – a great benefit for our patients. Our research and development programme also includes innovations such as the ultrasound or MRI-guided radiosurgery or heart radiosurgery. Hoogeman M, at al. Clinical accuracy of the respiratory tumor tracking system of the cyberknife: assessment by analysis of log files. Int J Radiat Oncol Biol Phys. 2009;74(1):297-303. Pepin EW, et al. Correlation and prediction uncertainties in the cyberknife synchrony respiratory tracking system. Med Phys. 2011;38(7):4036-44. Ernst F, et al. Evaluating and comparing algorithms for respiratory motion prediction. Phys Med Biol. 2013;58(11):3911-29. Blanck O, et al. Pilot-Phantomstudie zur ultraschallgeführten, robotergestützten Radiochirurgie. DGMP Jahrestagung 2013. Blanck O, at al. Dose-escalation study for cardiac radiosurgery in a porcine model. Int J Radiat Oncol Biol Phys. 2014;89(3):590-8. Colvill E, et al. : Benchmarking real-time adaptive radiotherapy systems: a multi-platform multi-institutional study. Radiother Oncol. 2016 Apr;119(1):159-65. Blanck O, et al. High Resolution Ion Chamber Array Delivery Quality Assurance for Robotic Radiosurgery: Commissioning and Validation. Phys Med. 2016. In Press.